Size: Select 1/2" 1/4" 3/8"
Designed by Gary Rance, one of England's finest production turners, the Robert Sorby® M2 HSS Easy Beader makes turning perfect beads just that, easy. Using this tool anyone can make single beads or a series of beads quickly and consistently. Also, make a perfect curved edge by using just one side of the tool. Held flat on the tool rest, a gentle side to side motion removes waste naturally and forms the bead. Sharpen with a diamond hone or oilstone by running it along the top of the tool. 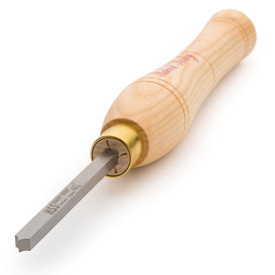 Robert Sorby® M2 high-speed steel turning tools have long been a popular line of woodturning tools. Still made in-house in Sheffield, England, their special attention to heat treating, material quality, and overall craftsmanship have made them one of the top choices in woodturning tools.